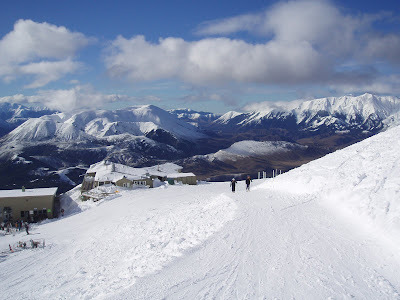 SNOEL'S BLOG: Cheeseman A skifield for Everyone??? Ok as its a bit of a boring Sunday afternoon, I thought I'd push on with my Ski Field reviews. As I've visited Mt Cheeseman a bit recently I think that would be my next best Ski Field to review. So. First up all the lowdown is at:www.mtcheeseman.com, so again no point in me repeating any of that. So Now I can give the place what I hope to be a fair and INDEPENDENT review. (again my review is simply my own impressions, and is in no way intended as a criticism of ski field staff. Its just how things are as I see it). My Ratings again - 10 outstanding, 1 very poor. For families Mt Cheeseman is stress free and cheap. Ok firstly the learners area is right outside the Cafe, so you don't have far to go, and the kids can easily come and go as they please. The day lodge is spacious, sunny and tidy with plenty of tables and cubby holes to store gear. Its nice too that the lodge faces the mountain, so that you can easily watch the kids coming down or playing in the snow. My eight yearold played just off to the left of the learners area, which was great as I could keep an eye on her. The big plus is that children ten and under ski for free, and there is also a moderate Junior rate for children over that age,which is reasonable. I think it cost Nick (13) $23 for a half day.You can drive to the lodge. There is a drop zone at the lodge, then you go down the road a bit to park the car, but it doesn't take long to walk back up. I recommend containerisation in plastic bins for gear and food. There is also free hot water in the lodge for drinks (which is good, better than NZSKI.COM 50c for hot water!). The terrain on the mountain too is pretty mellow, so it is better suited to independent exploration for the older ones who are capable. The learners tow is a rope tow, which is not my favourite, but the slope is well appointed, so the kids handle it pretty well.But parents can expect a few spills before their children totally master it, so they do need some hands on assistance to start with. Once the children graduate onto the T-bar again you need to ride up behind them, as they are probably going to fall off half way up a few times to begin with. Cat -tracks offer an easier alternative descent. Lessons are cheap too. I paid $20 for little madam to have a lesson, which turned out to be almost a one on one, and boy! did that instructor work! He pretty much earned himself a Nobel peace prize, as well as his $20! The accommodation - snowline lodge is well suited to children, although I haven't experienced that yet. Now, I found this a bit of a surprise! But Mt Cheeseman is absolutely fantastic for those wishing to gain access to the backcountry. Firstly being not too steep, its not too hard to skin up the cat-tracks to the top of ridge tow. From there you can walk or skin out to the top of Mt Cockayne easily, then ski/ride fresh tracks. For those wanting to go outside the ski area boundary - check in with the patrollers , then you can either head north toward Broken River, or South towards Mt Cheeseman itself. Heading south the first basin over the back is tarn basin and offers outstanding 300 - 500m runs. You can also ski over the ridge into the western slopes, and there are a few bowls offering steeper terrain. There aren't a lot of technical chutes, or 'extreme' terrain, but there are a few if you go looking. Longer tours can be planned heading towards BR, or Mt Olympus. I recommend James Brodbents guidebook for this- Baccountry skiing in NZ.I rate Temple slightly higher because it has more peaks, and technical ice climbing and mountaineering, opportunities. To be honest I considered giving a crap review and keeping this to myself! Mt Cheeseman is a solid little club field offering good service to families.If you were a family travelling in NZ I would strongly recommend it. However for visitors not travelling with kids, you may want to avoid it for the same reason! Or if you were looking for a 'resort', 'adventure'0r 'extreme'or even 'club field-cool' then you would probably be better served going elsewhere! However cheeseman dose offer stunning views, and is normally not that crowded, so you could do worse! I don't think this will come as a big surprise! Cheeseman dose have good rates for students. Those simply wanting to learn to ski cheaply, and don't mind being followed around by a bunch of ten year olds would probably rate this higher. $60 adult rate for T- Bars is pretty good value for money. When skiing at Mt Cheeseman you can get more runs in than when skiing rope tows (don't get me started). The terrain is mostly nice and easy skiing with a few areas that are more challenging. There are really good rates for half day skiing which I think is great especially if you are trying to support the kids in the morning, then you can maybe ski in the afternoon, take turns etc. Whoever designed the lodge did a good job. Its sunny warm and seems to function well in terms the operation of the ski field. The Cafe isn't that expensive, and they do a few normal things like toasted sandwhices. Its good that it faces the mountain too. I haven't stayed overnight at snowline lodge but I have wandered through. I like the Kitchen-living area, and there seem to be a few games and things around for people to do.For a child it must be a mystical sort of place, as it twists and turns, and seems like it must be full of secret rooms! There is also a forest lodge which I have stayed in a couple of years ago, and I think the rates are better, as it is at the base of the mountain. You can stay there in the summer too, as there is actually lots to do in the area - walks, fishing,caving,Mt biking, bouldering etc. For those wanting to extend their involvement in the field there is always membership of the club, which I could imagine would be attractive for those living in the Castle Hill area. Being centrally located in the Cragieburns Mt Cheeseman is 2km down the rd from the settlement of Castle hill, so is the local field for that community, who strike me as a nice bunch of motivated professionals with a passion for the mountains. The drive must take just over 90mins from Christchurch, so not the closest field, but definitely worth the extra time for the benefits. Mt cheeseman has a snow cat, so the runs are groomed every night, which is great for those who like to ski on piste, and frankly- I think thats a huge bonus for the place, as often the Craigieburns conditions can be 'variable' at least if your going to buy a lift ticket you are guaranteed some reasonable runs on groom tracks. If your a jibber looking for that cool scene -nah.Cheeseman to me seems to be all about families and kids, and pretty mellow laid back skiing, more on the fun side than 'extreme' or 'adventurous'.So no half pipes. Being on more of an open face than some of the other Craigieburn fields I could imagine there is less wind protection on the field on really windy days. And I think it would get the majority of bad weather from a Southerly direction, however it may be clear in a North Westerly (worth checking). As a craigieburn field Cheeseman is subject to our fickle weather, and may suffer the odd short or disappointing season. The road can be pretty steep and in wet conditions can be both muddy and icy. I would recommend that chains always be carried, and used when indicated by the ski field staff. The ugly can be a deceptive beast! Here I think the ugly is unsupervised children riding out of control, or beyond their limits without their parents knowledge. Mt Cheeseman is still an alpine environment and children and heavy machinery are never a good mix. Kids should either ski with their parents or under supervision, regularly checking in with someone, so they don't go beyond their limits. The ill informed. Skiing with kids and teaching kids to ski is hard work and that's why we have ski instructors. Its not worth a family melt down because you took an instructors course twenty years ago to try and teach them to ski yourself. The lessons are cheap at cheeseman, and the kids will learn far quicker with someone else!! Skiing is tiring for kids.My kids love to ski, so when we have a day of skiing coming up they will go off to bed an hour early quite happily the night before. They are also all responsible for their own equipment. Full priced gear for kids is ugly. Look for the second hand cash converter summer sales ($20 skis $20 boots), and buy the ski suits from Dress Smart. We have a retro collection of ski suits to rival any 80's ski weekend! Buying all your food from the cafe can hurt! We pack a lunch allowing for a bit extra as everyone gets hungry on the mountain. I buy a few coffees and Mt Cheeseman has a few low priced lollies for the kids. It can be a bit cheaper and healthier doing it that way. Ok. well that's the review. Mt cheeseman is a fantastic place for skiing with children and learners and surprisingly has excellent central access for ski touring the Cragieburn range. I hope you find the review useful and I do welcome any comments.